Welcome New and Incoming Students! Are you new to Aggieland or the Blinn community or just looking for a place to connect? We've got a place for you! Freshman/First Year/Transfer Students: Transitioning to college (and College Station) has its joys and challenges. We'd love to support you during this time, and have a number of ways to help you connect. In the fall, we have First Year small group, and a couple weeks into the fall semester, we'll have a progressive dinner so you can get to know more Treehousers better. 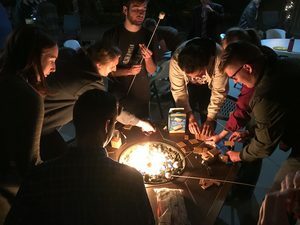 These are both good ways to connect to a great community that will help sustain, encourage, support, and challenge you during your college years. Other Students: Are you looking to connect to a community, but aren't sure what to expect? All are welcome in this community, regardless of your background, denomination, or experience. Pr. Mindy, Mike, or the leadership team would love to take you out for coffee to get to know you better and to tell you more about this group. There is a place for you in Treehouse! Don't have a car? No problem! Our upperclassfolks are glad to pick you up - for church, for regular gatherings, and to take you out for coffee. To be added to our listserv or to learn more about connecting to this ministry, contact Mike.